Much like the show's namesake, the Clones have been an integral part of the series, and the episodes that have delved into the origins of the Clone Troopers have long intrigued fans. While the Expanded Universe and A New Hope have boasted of an "Imperial Academy," where men trained to become pilots and soldiers for the Empire, when the Republic fell, the Clones evidently evolved into the first Stormtroopers. Tasked with keeping the subordinates of the galaxy in their proper place, Stormtroopers appeared to be identical. Besides rank and number, there was no way to distinguish one from the other. Clone Wars had the opportunity to broaden our knowledge of the men clad in white armor, and The Star Wars: The Clone Wars crew has noted that they wanted to not only individualize each Clone trooper, but that they have desired to explore the Clones' origins. Clone Wars episodes such as "The Deserter," "Clone Cadets," "ARC Troopers," and the entire Umbara arc have not only dissected the inner workings of a Clone, but have peered into how Clones make decisions that oftentimes deviate from instruction commanded by superiors. "Rookies," was one of the first episodes to truly introduce us to who the Clones were as individuals, and introduced us to the rookie CT-5555 who preferred to be called Fives. Fives was a part of Domino Squadron and was stationed to a listening post, which was located on one of the Rishi moons. Still "shinies," the squad proved themselves when they fended off droids with Captain Rex and Commander Cody. Although the squad lost a valued member of their team during the droid attack on the post, Fives was among the Clones that was honored for their heroism and dedication to their duty. Now no longer a rookie but an ARC Trooper and an experienced fighter, Fives plays a pivotal role alongside his fellow Clone brother Tup in The Lost Missions' "Order 66" arc, which explores the repercussions that the choices of a single Clone can have on the entire Republic. Fans were first introduced to Tup in the Umbara arc. Tup was among the men that knew about Fives' plan to blow up the enemy supply ship, but kept quiet about it until pressured into telling the Jedi General so as not to avoid being caught lying by omission. Fives cheated death when he was court marshaled by Krell, only to be spared by Tup and his Clone brothers who knew that Fives had done his duty. Later in the arc, after learning that Krell had pitted his Troopers to attack their own kind, Tup devised the plan to lure Krell close to a vixus, a sarlaac-esk creature that caught unsuspecting prey with it's vine-like tentacles. Although Fives was nearly executed by Tup in the Umbara arc, in the "Order 66" arc, he claims that Tup is one of his best friends, standing beside him when all the odds were against his Clone brother. What was meant to be a routine battle in the space station that lingered above the planet of Ringo Vinda went awry when a Clone made a decision that altered the course of the attack. It appeared to be just a headache, a lingering buzz in the mind of a Trooper that was distracting him from staying focused on the mission. Tup showing early signs of being unwell should have been a huge warning for Fives. Didn't Tup's glare and the gruff way he said, "Jedi!" set off an internal alarm that something wasn't quite right? Although Tup shrugged it aside and seemingly dismissed the feelings as jitters, something wasn't quite right with him. He knew it, and so did his Clone brother Fives. Pulling his 'bucket' down over his head, Tup gripped his blaster, and reminded Fives that they "don't want to get left behind" before rejoining the other men and Jedi, an unfortunate mistake. Twin Jedi Masters were introduced this arc--sisters named Tiplee and Tiplar. While their species and origins were not revealed in the arc, according to StarWars.com, their designs were "based on concept design for a female Sith Lord that Iain McCaig developed for Episode II that ultimately was not used." What was unique about the fraternal twin Jedi was the aquatic-like movements of their head tendrils, and the fact that their movements consistently flowed like they were submerged underwater. For this reason, many could confuse the green-skinned Tiplee for a "female Kit Fisto." Throughout the battle in the space station, Tup grew agitated, succumbing to what others began calling a "mental illness." His 'sickened' state brought him to do the unthinkable: murder. Shooting a blaster bolt through Jedi Master Tiplar at point blank range, Tup was restrained and taken in for questioning. When he struggled to remember the events and threatened Tiplee, Tup was shipped back to his "home world" to be examined by the Kaminoans--a second big mistake. This arc also gave fans more of an insight into the natives of Kamino. Much different than the passive, gentle beings that were revealed to fans through the characters Taun We and Lama Su in 2002's Attack of the Clones, the Kaminoans of "The Unknown," "Conspiracy," "Fugitive," and "Orders," are secretive, rigid, and ruthless. Throughout the arc, we learn that not only were the Kaminoans instructed to keep secrets from the Jedi, but that they play a pivotal roll in a larger Separatist plot. When the Kaminoans failed to make progress in the Clones' favor, Fives decided to talk AZI-3, a medical droid that provided comedic relief throughout the arc, to proceed with a brain scan. The viewers learn that Tup's condition was indeed accelerated, and that his chip had 'rotted' and was a tumor. The unlikely duo disobey direct orders and create a distraction to carry out a biopsy on Tup before he can be 'terminated' by Nala Se. Nala Se, the principal engineer behind the clone army, guards secrets under the instruction of Dooku. Secrets that will eventually contribute to the downfall of the Republic. 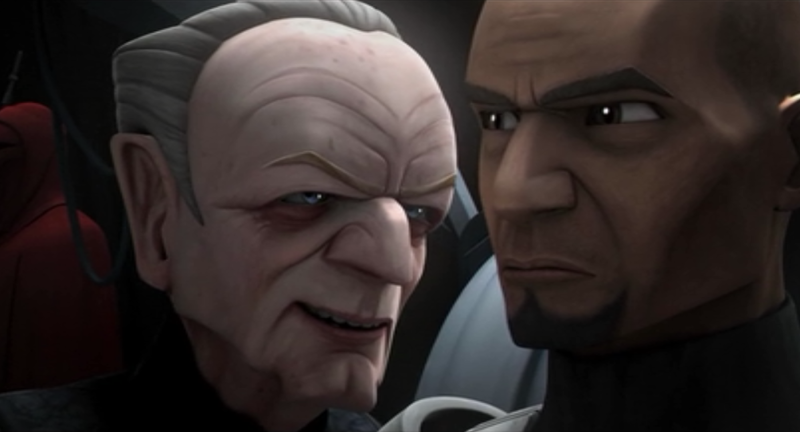 What was interesting to learn this arc was that Dooku was well aware and working closely with Darth Sidious regarding the biological warfare and exploitation of the Grand Army of the Republic. The Clone Wars put an interesting twist on Order 66: Every Clone has a chip in their brain that can force them into action against their will, as Fives discovers with the help of droid AZI-3. While Nala Se swears that the chip was implanted to make Clones docile and receptive to Orders, the chip is in fact linked to Order 66, a command that when given would brainwash a Clone into believing that the Jedi is the true enemy. It turns out that Lama Su, the Prime Minister of Kamino, knew about the "inhibitor chip" the entire time. This chip links back to what Lama Su discussed with Obi-Wan Kenobi in Attack of the Clones: "We modified their genetic structure to make them less independent than the original host." Less independent, or made responsive to any and all preprogrammed orders, including the ability to murder leaders on command? At this point of the arc, I was really starting to get frustrated with Shaak Ti. While Shaak Ti is a strong and gentle character by nature in Star Wars, throughout this entire arc I couldn't help but question why the Clone Wars writers chose Shaak Ti to accompany Tup to Kamino. Yes, she had history with the Clones in previous episodes, but it seems like she was chosen because the writers wanted her to take a passive stance on the situation. I feel that if the writers had replaced Shaak Ti with Anakin, Obi-Wan, or Yoda, that events would have unfolded differently, that the Kaminoans would have had a more difficult time covering up the Separatist plot, and that Dooku and Sidious would have had to divulge a new way to exploit the Grand Army of the Republic. If Skywalker was involved, he would not have let Nala Se have all of the say in Tup's examination. Instead, he would have taken action to discover the Kaminoan's true intentions. After the tumor was removed from Tup, the Clone started ranting about "the mission" and the nightmares, stating that he was finally free from all of the nightmares, the one that "all of the Clones have" before dying. Fives was immediately arrested for his actions and was sentenced to get his memory erased to be placed on sanitation detail. While the Jedi believe that Tup may have been compromised during a mission that proceeded the event and that the Separatists may be using the Clones to gain the upper hand in the war, Fives breaks free and decides to take matters into his own hands and after further investigation into the chip, he learns that there may be a larger conspiracy and decides to have his own chip removed. After being confronted by Nala Se and Shaak Ti, Fives presents the evidence that he has gathered, from the inhibitor chips to the tumors, and believes that he needs to take them back to Coruscant. Shaak Ti agrees that Palpatine did request everything linked to Tup's case be sent to Coruscant, and the arrangements were made. Fives' next move, requesting an audience with Chancellor Palpatine, was a fatal move for the ARC Trooper. Everything had to work according to Sidious' master plan to orchestrate and eventually execute Order 66, right down to eliminating anything that was not a part of the Sith's original equation. As expected, Palpatine twisted Fives' words and set him up to attack the 'defenseless old man,' and as Fives attempted to escape the Chancellor's chambers, Clones were already armed and in pursuit. The Chancellor had a lot of dialogue in these episodes and with the regrettable passing of Palpatine's previous voice actor, Ian Abercrombie, actor Tim Curry was hired to step into Sidious' shoes. Tim Curry is a phenomenal actor, with experience in a wide range of projects from Annie and The Rocky Horror Picture Show to Ben 10: Omniverse and The Adventures of Jimmy Neutron. However, throughout Palpatine's scenes, the only character that I could hear talking was Nigel Thornberry, a TV character that I have not seen, heard, or even thought about since my elementary school days. Curry still accurately portrayed Sidious as the sinister Sith Lord that Abercrombie voiced, but Thornberry's "smashing!" lingered in my mind. At this point in the arc, if you weren't rooting for Fives, who were you rooting for? Fives risked his life, his status as an ARC Trooper in the 501st, and his reputable reputation to bring a twisted conspiracy to light. After chatting with a colorful cab driver who retorted "Eh, your mother's a droid!" when the Clone didn't pay for his ride, Fives rendezvoused with a fellow 501st member in the 'freshers of 79's, Coruscant's resident Clone bar. Not only was 79's our first look at 'Freshers in the Clone Wars universe, but it was a firsthand look at Clones off duty and off of the battlefield. Who knew that Clones had leisure time to spend at a bar? Besides, isn't ten years old below the legal drinking age on Coruscant? From dancing Twi'lek women and shots to Podraces being flashed up on large holoscreens (but still no Ben Quadinaros! ), 79's was definitely a behind the scenes peek into a Clone's world. As Clones from all different ranks and battalions drank to the Republic and the "212th," Fives slipped out of the bar as shock troopers followed his trail. When Fives lured Rex and Anakin Skywalker to a wear house to convince them of the Kaminoan conspiracy, he had nothing but good intentions. Fives' quest for truth and clarity did not end well for the soldier, and picking up his blaster to resist arrest from his Clone brothers was his final mistake. Gunned down by his own kind, Fives collapsed onto the floor of the wearhouse just before Rex reached him. Cradling the dying Trooper in his arms as he called for a medic, Rex tried coax Fives into holding onto life, but they both knew that he was dying. 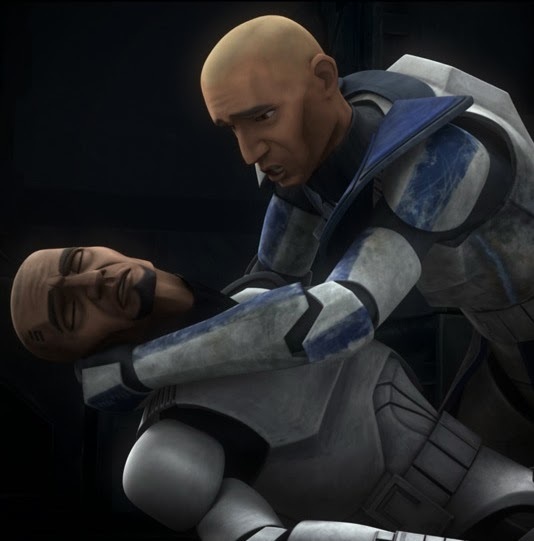 Fives died in the arms of his commander in what was one of the most emotional scenes in Clone Wars history. As Fives choked on his own words exerting that all he wanted to do was his duty, he reiterated what Tup had said about finally finding freedom. As his Clone brothers who had shot him down following their own orders gathered around, Fives slipped away. Clone Wars has been recognized for the morals that accompany and almost summarize each individual episode, and The Lost Missions did not disappoint. From "the truth about yourself is always the hardest to accept," to "the popular belief isn't always the correct one," the arc was as thought provoking as it was heart wrenching. What has come to be called the "Order 66" arc, is more of an arc that revolves around the events of a Clone who was desperately trying to do his duty to the Republic, only to be silenced for trying to uncover the truth. From the space station above Ringo Vinda to Kamino and then Coruscant, Fives was a loyal brother to Tup and to the Republic, even his dying breath was spent trying to prove that the conspiracy was bigger than anyone would believe. What if Fives had never died? Maybe he could have convinced Rex, if no one else, of the chips' existence and he may have spent the rest of his days in a Republic cell. Could Order 66 have been prevented if Fives could have convinced Skywalker that the Chancellor and the Kaminoians were involved in a Separatist conspiracy? Although it was difficult watching Fives struggle for truth only to have the secret perish with him, I believe Fives made the right choice. Choosing to die with honor instead of living a lie, he fought to the death to expose a dastardly secret that would tear down the Republic from the inside. The "Order 66" arc demonstrated that the Clones were more than just a number that robotically followed instruction. The episodes proved that there were Clones who knew the truth about the Separatist plot protocol 66, Clones who would have rather died fighting for the Republic, their first mission, than murder their trusted Jedi generals. With his chip removed, Fives would have lived to see "protocol 66" executed and would have stood by as his brothers mercilessly cut down Jedi after Jedi following the 66th order that they were preprogrammed to obey, and he wouldn't have been able to do anything to stop it. Fives being honored for his heroism in Season One's "Rookies"
Does anyone think it's possible for clones to disobey Order 66 now? Back when Republic Commando was around, they had a choice, but now it doesn't seem possible. I could use the help since I am working on my own fan fiction too. commandos and arcc troopers had an increase in the cpacity for independent thought, allowing them to think outside of orders. if a clone exhibits these traits and they are strong enough he can break free. the only other way is to remove the inhibitor chip.